When it comes to your parrot’s health, nothing is more important that making sure it stays fit and well. 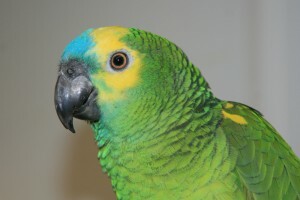 And ensuring that your parrot has access to vet care when needed is an important part of this. That’s where parrot insurance with ExoticDirect comes in. Parrot insurance can cover those unexpected vet bills, taking the financial strain off you. The Parrot Society has worked with ExoticDirect pet insurance for many years, and as a Parrot Society member you can receive one month free when you phone ExoticDirect and purchase your policy. You’ll need to quote your PSUK membership number. You can call ExoticDirect on 0345 982 5505. Loss as a result of weather perils is also covered. So if your bird is kept in an outside aviary, then proven loss caused by the weather can be covered. There are three policy types to choose from and you can insure up to three large birds per policy. • £1,500 of vet fee cover, covering up to three birds. If you own a collection of small birds, we offer a separate policy. This offers £1,500 of vet fee cover for each bird, and you can add as many birds as you like to the policy. This cover level is only available to purchase over the phone. Just call: 0345 982 5505. And if you own a Bird of Prey, you can insure it too. You can also add on Non-Return cover to Bird of Prey policies that cover £5,000 of vet fees. To add this to your policy you’ll need to phone ExoticDirect on 0345 982 5505. Finally, ExoticDirect can also insure your aviary for up to £5,000 as an add on to your policy. You can only add this to policies over the phone. Don’t forget, in order to redeem your Parrot Society member discount, you’ll need to call ExoticDirect quoting your PSUK membership number. There are of course alternatives to purchasing insurance, but as vet bills can and often do quickly escalate. If your bird has an ongoing condition, any savings can quickly get used up. Leaving you with cost dependent choices to be made. Why are veterinary fees so high? Vets have access to far better diagnostic equipment and medications than ever before, however these advancements are expensive. Veterinary practices often cannot afford to pick up the costs themselves and have to pass them to the pet owner. Other factors to influence pricing include the costs associated with running a 24/7 practice – which is required by law to provide emergency treatment when needed; the region where you may live – vets in some regions are more expensive than others, as property costs and business rates vary; VAT – at 20% this is added to your bill ; and the cost of referral fees which may be added to your bill, if you were referred to a specialist vet. If you choose to insure your bird, you’re giving it a chance at getting the best treatment available, and you’re removing the financial strain on yourself. Claim your Parrot Society discount today when you purchase your policy. Call 0345 982 5505.